Baker Perkins is launching an upgraded and extended range of Accurist™ dough dividers. Now known as the Accurist2.1™ and available worldwide, the new range is a development of the Accurist2™ and retains all the features that enabled the original machines to offer a unique combination of sustained scaling accuracy and gentle dough handling. Maximum output has been increased to 10,800 pieces per hour with the introduction of a six-pocket version. New features include the Intelligent Dough Weight Control system. This reduces the average dough piece scaling weight by adjusting the divider in real time to compensate for changes in dough density. The system reacts to the gradual changes that occur over the life of a batch as well as the sudden changes that occur when a new mix is dropped into the divider. Working in conjunction with feedback from the checkweigher, the system maintains dough piece weights within tighter limits, reducing giveaway and enabling the target weight to be lowered. The Accurist2.1™ includes a new oiling system with improved performance. An upgraded filtration system keeps the circulating oil clean while a new pumping and dosing arrangement ensures it is delivered accurately and consistently. Improved oil pathways in the ram provide reliable distribution enabling the divider to run for extended periods. Output has been increased by the introduction of a new high-capacity model featuring a wider, six-pocket division box and strengthened internal components. External dimensions remain unchanged. For typical 900g (32 oz) dough pieces the maximum output is raised from 9,000 to 10,800 pieces per hour. High-output bread plants up to this capacity can now run with one divider, rounder and intermediate proofer instead of two. 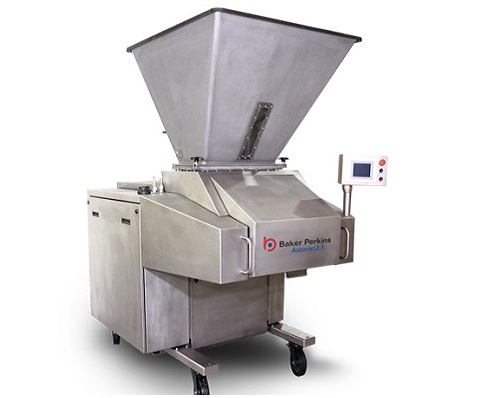 This reduces capital and running costs and also improves product consistency by processing each dough batch more quickly. When operating at lower outputs the divider will run more slowly than a five pocket machine, leading to reduced wear and lower oil consumption. The Accurist™ range, introduced to the USA industry 18 months ago at IBIE, has earned a reputation around the world for sustained scaling accuracy. With no-time dough, an outstanding Standard Deviation of just 2.5 to 3.5g (0.09 to 0.12 oz) is maintained on 900g (32oz) dough pieces over 10,000 hours of operation without any parts being replaced. Improvements introduced during the life of the previous machine have been carried over. These include a new lightweight die which reduces running costs by extending the cleaning interval, reducing oil consumption and having a longer life. The Accurist2.1™ is part of a Baker Perkins system to divide, round, mould and pan dough pieces gently and without the use of dusting flour. The elimination of dusting flour brings significant cost savings by eliminating the cost of flour, flour dusting equipment and its maintenance and cleaning. Sanitation standards are significantly raised, labor costs reduced, and potential health and safety risks to employees eliminated.